For my winter vacation 2012 I decided to visit Kyushu again. I went to many places in 11 days. Among them were: Nakatsu and Yufuin (in Oita Prefecture), Takachiho, Nobeoka and Miyazaki (in Miyazaki Prefecture), Yakushima (in Kagoshima Prefecture) as well as Gunkanjima, Omura, Hirado and Shimabara (in Nagasaki Prefecture). Previously I’ve already been to many other places in Kyushu, so this time I wanted to visit places I’ve not been to yet. And I also went back to Kyushu many times after that. The most recent visit was in December 2017 (Miyazaki Prefecture). Shopping and relaxing in Yufuin. It was super cold. Luckily Yufuin in a onsen town, so you can soak in a hot spa to warm up any time! One of my personal highlights was definitely Takachiho! I went there on December 31st, so there were a lot of people! I also took a boat tour for 1500 yen. At first I thought it’s a waste of money and boring alone, but it was totally worth it and a lot of fun. Power spot: Pile stones to get lots of power for this year! I did it, too! And one of the absolute highlights: Kagura dance at night at Takachiho Shrine! I took many videos. You can see some of them on my Youtube channel. On January 1st I left Takachiho. Next I went to a shrine on a hill (Imayama) in Nobeoka City with a huge statue. If you touch its feet, you’ll be blessed with good fortune. After Nobeoka, I went to Miyazaki City from where I took a bus to my next destination: Aoshima, a very small island in Miyazaki that can be accessed via a small bridge. It’s famous for Aoshima Shrine and the demon’s washboard. Another highlight for me was Udo Shrine, which can be reached with the same bus as Aoshima. It’s all along the beautiful Nichinan Coast, so you can easily visit it all in one day. The actual shrine building is inside a cave and the ocean view from there is stunning. My last destination of that day were the Moai at Sunmesse Park, also in Miyazaki. I left Miyazaki Prefecture to take a ferry to famous Yakushima. Don’t be fooled by this photo, the weather was absolutely horrible! First of all, the weather changed every few minutes and my first driving experience was in the middle of a typhoon with super high waves, extremely strong rain and whatnot! There was also lots of snow and it was super cold. Crazy, but beautiful island! Most of the time the weather looked like this! There are many smaller and bigger waterfalls on Yakushima. Of course, I also went to Yakusugi Land and Shiratani, but only the short walking courses were easily accessible, because the other routes just had far too much snow! I also went to the “Princess Mononoke” forest (the forest that inspired Hayao Miyazaki). Back from Yakushima I went to Nagasaki to visit yet another small island: Gunkanjima (also known as: Battleship Island). It’s an uninhabited island. Until 1974 up to 5000 people lived there, working at a coal mine, but when the demand changed to oil, business didn’t go too well, so all the people left the island rather quickly. Since then the island has been exposed to typhoons and tsunamis and so the buildings there slowly fall apart. That’s why until recently you were not allowed to even access the island. Now it’s possible again, but only to certain areas and only with a tour guide (Japanese only)! This island was actually a shooting location for the James Bond movie “Skyfall”. Hirado in Nagasaki: the only place where you can see a traditional Japanese temple with a Christian church in the background! It’s a very popular motive for postcards. While in Nagasaki I ate a lot of “chanpon” (ちゃんぽん) and “sara udon” (皿うどん). I love “chanpon” so much that I eat it even outside of Kyushu, but it tastes best in Nagasaki – if you ask me. I got to see a lot of awesome castles again! I think by now I’ve been to over 60 Japanese castles. In the picture above you see Shimabara Castle (Nagasaki). I also came across a lot of cute and funny things again. I visited yet another active volcano in Japan: Mt. Unzen in Shimabara City! And when there’s a volcano, hot springs are not far! The “hells” of Unzen are not as great as the ones of Beppu (I visited them in winter 2009 – will post about it in the future, too! ), but have a sad history. This was a super brief review of my winter vacation, I hope you enjoyed it nevertheless. Despite the horrible weather it was a really nice vacation. I met a lot of interesting people and saw so many beautiful things again. Oh, thanks for finding time still to post about your vacation. I know you’re too busy with so many things right now. I’m pretty sure I’ll enjoy your full posts about your travel later on as much as I enjoy reading this preview. Nagasaki is a to-go place on my list. The boat ride under the waterfalls in Takachiho looks fun. The view in Miyazaki is amazing! I truly enjoyed this post, as I do all of them, really, but I am fond of Kyushu and Yakushima. I remember Yufuin well, and its myriad shops, and Unzen “hells” [saw them in very overcast weather, though]. I have some photos of the devil’s washboard at Aoshima, if you care to add them to your post. Let me know. Your picture of the gorge at Takachiho is breath taking. I regret I have not seen it. Takachiho is often overlooked. It’s quite a bit outside of Miyazaki City, but it’s so worth a visit! Your pictures are fantastic! I always think that, but your skill is still improving, it’s obvious. Very professional! Thank you so much for finding time to post. Thank you so much! They definitely don’t look professional, but I sure hope I’m slowly improving! Hi, C! Please tell me what your definition of “professional” is. Does professional mean you shoot fashion models, or movie stars or nature for National Geographic? EVERYBODY compliments you on your photography and you are published, so YOU ARE PROFESSIONAL!!! No, but a pro usually KNOWS what he/she is doing. I don’t!! I really just point and shoot, not thinking too much about it. hey, thanks for this, I went to some of these places and it’s really inspiring to hear and see your take with such awesome photos, and some good writing. 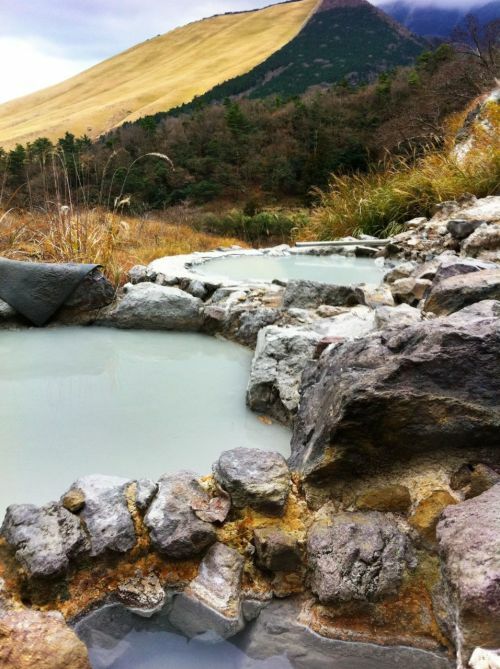 I was planning a trip to see Mononoke forest this month too!, I just went to Beppu and Yufuin during New Year’s, mm good, but a really special treat was the wild natural onsen I found in the mountains. I really hope I can update my list and post it here soon!